Hello from Lindsay & Chris + Everest! We are Called to Wander! 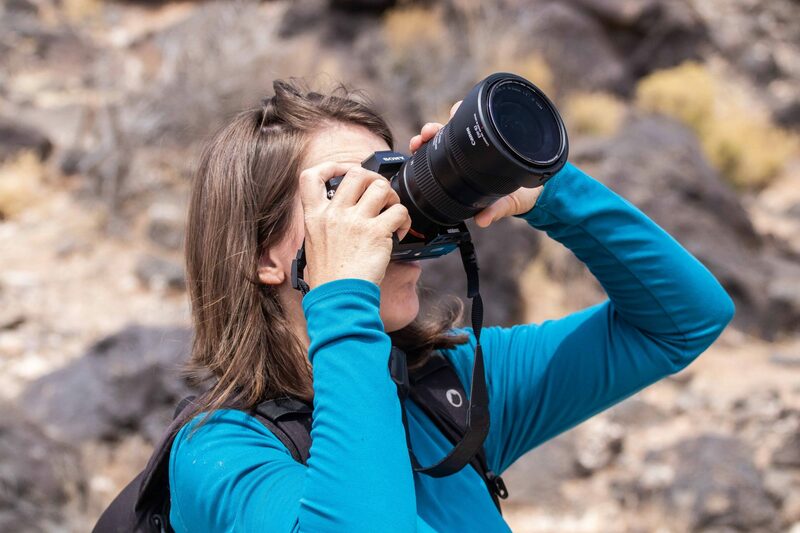 Called to Wander is a travel blog committed to storytelling as a means to provide you inspiration and information that helps you overcome obstacles in your life so that you can travel with purpose! Currently we are in our thirties and have no kids or debt. We sold everything that we own, bought and renovated a truck camper RV and started our lives on the road! We live full-time out of our truck camper with Everest, our sweet Australian Cattle Dog. Our goal is to provide you with the inspiration and information that allows you to travel on your dream adventure. It is our hope to teach you that you can positively impact the world while fulfilling your own travel dreams. We love sharing stories, photos and videos from our journey. We hope to multiple our impact by encouraging you to take steps in planning a journey of your own. The Pan American Highway is a loose collection of highways that connect over a dozen countries in a nearly 20,000 miles stretch between North and South America. Currently there are thousands of overlanders at various stages of completing the drive in part or in whole. In 2016 we had the vision to drive the Pan American Highway from Alaska to Argentina. It is really something we can’t quite explain. We just felt a calling in our hearts to go. And we trusted that we would figure out more about our calling once we got on the road. At the time we were fostering 8 children in a group home. We also owned a 40-year old fixer-upper sailboat. And we knew very little, if anything, about what the journey would entail. But we were inspired by the idea that we might hit the road to complete the drive one day. We felt it was part of our destiny. After nearly two years of preparation and planning we began the journey to reach Alaska from our home in Florida. When we began the adventure in spring of 2018 we didn’t have enough money to complete the entire journey. But that too is part of the excitement of our story. Every day we have to overcome challenges. We desire to connect with people at every step of the journey. And we are learning to be dependent upon the kindness of strangers. We help people everywhere we can, however we can. Our comfort zone stretched beyond anything that we imagined. It is impossible to calculate the impact that others have on us. 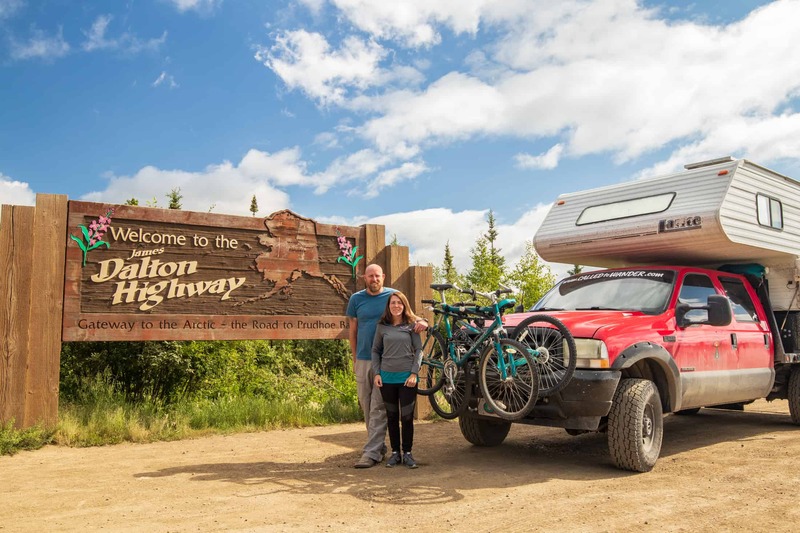 Oh, and Lindsay has Crohn’s Disease and is attempting to be the first woman with the disease to overland in a truck camper from Alaska to Argentina. Because the disease limits mobility, most people with Crohn’s Disease don’t travel too far from their comfort zone. There’s really no information out there on how it is even possible to do this. So we’re forging a way through the unknown to help inspire and inform others on how to overcome obstacles in their lives to pursue their travel dreams. Despite the challenges we face, we are determined to pursue the abundant life. And we are committed to overcoming the obstacles that keep us from helping others as we fulfill our dream to travel. We hope our story inspires you in some way. We have always been inspired by adventure and those who have gone before us in exploring the world. So we made changes to our lifestyle and began planning the possibility of the trip. We saved very aggressively. From time to time we worked extra jobs and found other ways to make a little money here and there. Toward the very end we sold or gave away the last of what we owned. We didn’t have enough money to complete the journey. But we knew that we had to begin at some point. So in spring 2018 we hit the road. We wandered a meandering route from our home in Florida to Deadhorse, Alaska at the top of the world. This journey in itself covered twenty states, three Canadian provinces and over 10,000 miles. It proved to be both exciting and educational. We are blessed in life. From the fortune of being born into a life of freedoms and prosperity in America to the opportunities that exist for us for life, liberty and the pursuit of happiness, we have been given much. We believe that part of our responsibility, and joy, in being given much is to also give much to others. Travel. Connect. Explore is core to our life mission. We think it should apply in some way to yours! Despite the challenges that we face – from existing health concerns to fully financing the entire journey – we believe that we are called to serve others in life and look forward to the opportunity to do so! Lindsay is the photographer. She is the kind of girl that loves to experience as much as she can. She is content with little and makes the most of what she has. Lindsay is not afraid of change. She loves to move. She loves to try new things. To explore. To create. Lindsay doesn’t feel pressure to conform to the status quo. She is simple and she enjoys the simple things in life. Lindsay loves horses, photography and exploring new places. She wants to look back one day on her life and know that she lived it beautifully. Lindsay was born and raised in Jacksonville, Florida. She had a delightful childhood until around the age of 12 when she experienced tremendous pain that led to an eventual diagnosis of Crohn’s Disease. Life became more of a struggle for her then. Due to her illness and severe depression, Lindsay dropped out of high school and began working odd jobs just trying to manage her illness. In this time Lindsay happened to attend a horse camp and after only a week she fell in love with them. She ended up spending the rest of the summer as a volunteer at the camp just so she could be around horses. Lindsay became interested in all things related to horses and in the many times when she was confined to her bedroom due to Crohn’s flare ups she became an encyclopedia of horse racing. To this day she does not miss a single major race! Lindsay also developed a deep desire to travel. Being restricted to the comforts of her home most days of the year led her mind to wander to the many possibilities of the world beyond her bedroom. Eventually Lindsay enrolled in the local community college and earned her GED. She continued to put herself through earning her Associates degree in art, where she focused on photography, a second passion of hers. Chris is the writer. He loves to travel and to plan. He finds balance between enjoying where he is and preparing for what comes next. Chris has an insatiable desire to see more, to do more, to experience an abundant life. He loves the ocean, traveling to new places and sharing and teaching others the things he has learned in life. 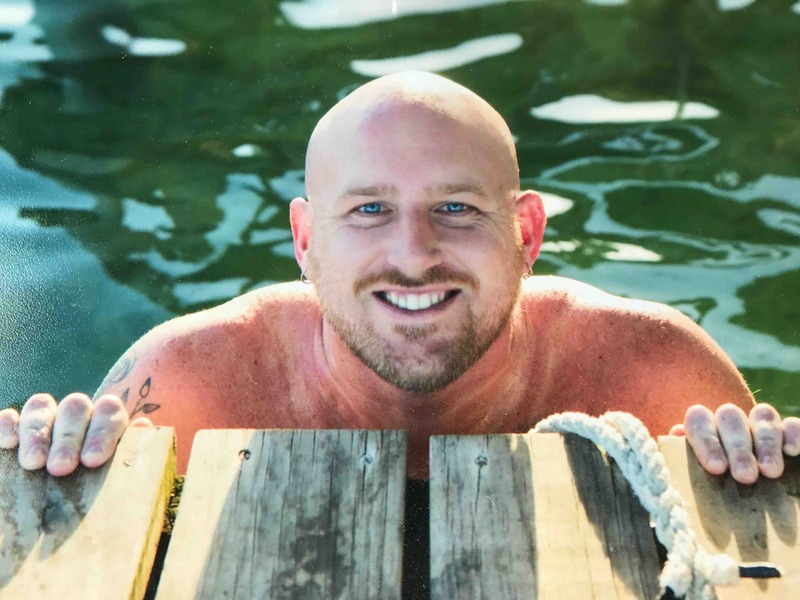 Chris loves the idea that anything is possible and, with the right planning and preparation, that he can live a life that inspires people in some profound and important way. Chris was born in California. Before he turned one year old, he traveled across the country several times. His parents relocated from California to Florida and Chris was every bit a part of the move. As a child, Chris was a jerk – well, rather, a jock, who played pretty much any sport in which he could show fierce competitiveness. He fell in love with basketball, at about the same time in life he had a major growth spurt that gave him an advantage over his peers. Through junior high and high school Chris dreamed of playing basketball at the collegiate and professional levels. His backup plan was to attend the US Naval Academy and become a fighter pilot. However by the time he was a senior in high school he had abandoned both dreams in order to figure out “who” he was. As that story goes, Chris attended several colleges. But at the end of those years, still didn’t have a clue “who” he was. But he stoked a wanderlust, taking his first solo backpacking trip across Europe. Then again, upon graduation from college, he wandered the South American continent. Chris found that he wanted to start a career where he could help people. And he wanted to have enough time to himself to wander the globe. This led him to become a high school teacher. Chris traveled at pretty much every opportunity. He explored the United States (including Hawaii), Japan, Bali and Honduras, where he would return nearly ten times in as many years. He left teaching to work with a friend who he would later partner with in running a documentary studio. This was more of an excuse to get paid to travel more of the world. It also taught him that he wanted to work for himself in pursuing his passion to travel and to write. 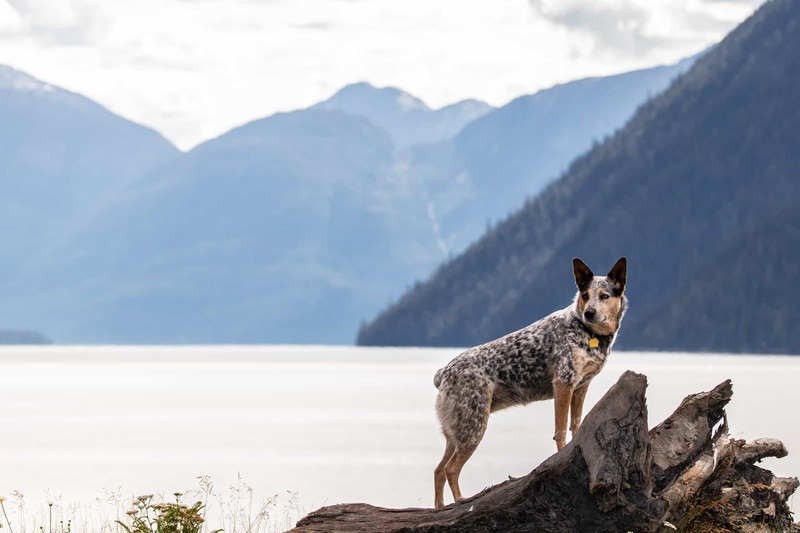 Everest is an Australian Cattle Dog. Her mother is a “Blue Heeler.” And her father is a “Red Heeler.” This combination gives her the perfect balance of color in her coat that draws the most attention. Everest was born in Missouri in January 2016. At eight weeks old, she arrived in warmer climates in central Florida where Chris drove to meet her breeder. Hardly the size of his hand, Everest the pup spent the two hour drive to her new home perched on Chris’ shoulder. When introduced to Lindsay, the sweet pup started climbing her leg, the stairs and pretty much anything else she could find to climb. Everest earned her name by climbing everything but the mountain itself. Everest loves chasing squirrels and wild turkeys, rolling on the floor and catching an all-too-frequent nap wherever she can. Though a cattle dog by nature, she prefers to nip the heels of horses and goats and is deathly afraid of cattle. Everest loves riding shotgun in golf carts, vans, trucks and pretty much anything that moves. Our “rig” is a truck and camper combination often a “cabover camper” or a “slide in camper.” We searched very carefully and particularly for the right truck and camper combination and in our current setup we are as perfectly matched as we can be. Our truck is a 2002 Ford F-250 Crew Cab Flatbed 4 x 4 with a 7.3L Diesel Engine. The truck has nearly 500,000 miles on her. But she continues to run strong with her 7.3L diesel engine, which is known to earn 1 million miles. Because she is a flatbed, we were able to build custom storage beneath the camper where normal trucks would lose space with their bed siding. We have added a winch to the front, airbag suspension to the rear axle and beefed up our tires to the largest, most reliable all terrain style. The truck also has a “long bed” so she is able to comfortably carry either short-bed or long-bed campers. Our camper is a 2005 Lance 845 slide-in camper. It has an 8-foot floor, whereby 6 feet fit on the truck bed and approximately 2 feet hang off the rear. We intentionally bought a short-bed camper for our long-bed truck so that in addition to adding storage beneath the camper we also have additional space between the camper and the truck cab. In addition to the cosmetic upgrades and convenience items, we have added an additional battery, two 100-watt solar panels and an inverter in order to provide us “off the grid” reliance on renewable energy. Lindsay and Chris were destined for each other, though it would take Chris over thirty years of wandering the world to find Lindsay. By the time they met he had traveled across the United States several times, throughout most of Europe, South America, Japan and Bali. He had a wanderlust that was fed by spontaneous trips to the Caribbean island of Utila, off the coast of Honduras, and the traveling he was doing in assisting in the production of documentary films. But his visit to Cuba, a country he dreamed of visiting since he was a child, was the most important of any journey. Lindsay had been only slightly less active in her travels. She too had ventured across the United States and had visited a handful of countries on various cruises that she had taken with her father. With a wanderlust comparable to that of Chris, Lindsay sprung on the opportunity to attend a mission trip to Cuba as her love of the Latin culture, particularly its dancing, drew her curiosity to the closed country. 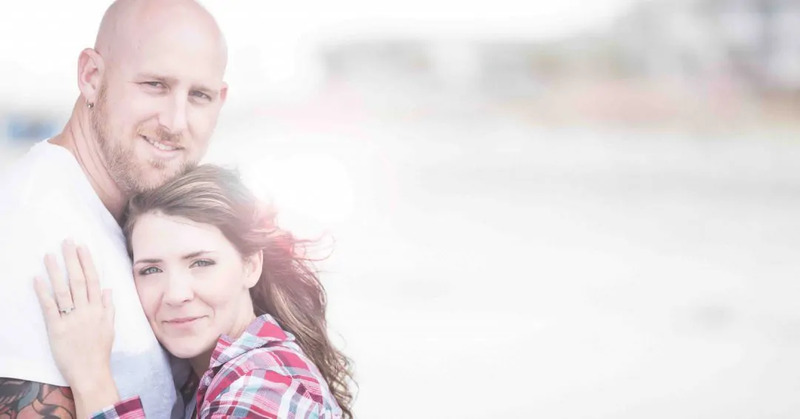 Lindsay and Chris attended the same church and sat within a handful of rows of seats away from each other for nearly three years before they actually met in the spring of 2013 on that fateful trip to Cuba. They both have pretty wild backstories for how they ended up on that trip. But as a result of similar interests to meet and photograph the Cuban people and places they visited they became fast friends. Chris, always the romantic, says that their official first date was on the last night of the trip when they had the occasion to share conversation over a mojito on a rooftop bar overlooking the Santiago city streets below. Lindsay claims the first date didn’t happen until they returned to the US and Chris invited her to go to Wal Mart to buy some stinky bait shrimp to fish at midnight in the murky flow of the St. Johns River. You be the judge to which is a more romantic beginning of their relationship! By September Chris knew that he would marry Lindsay. But he made the mistake to try to propose to her in the middle of a fishing trip. He had asked her best friends and family, along with his, to observe the moment from a beachside condo. However Lindsay would hardly leave the water to accept the proposal because she was catching fish left and right and Chris had to trick her into changing out her fishing tackle so that he could drop to his knee and propose. 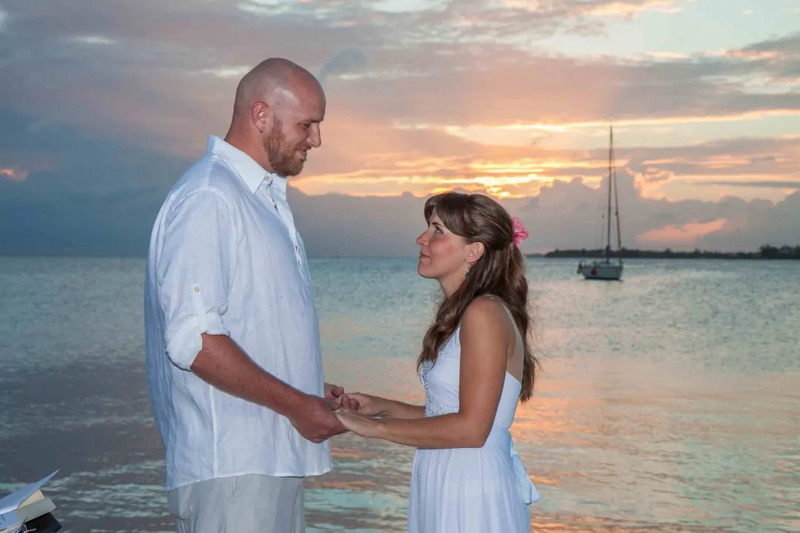 They married on New Years Eve on Utila, the island of their dreams. Chris had spent the previous two Christmas seasons on the island. Lindsay could think of no better place to exchange vows. Neither wanted a traditional wedding. So they wed at sunset in the presence of only three friends. It had poured down rain all day. And it only let up for the twenty minute ceremony. But that was enough to bless their marriage in the beauty of the island. The next morning they sat at a table drinking coffee and sharing their dreams of the future. They made a list of things they wanted to do in the new year. But more importantly, a bucket list for their new life together. They are now in their fifth year of marriage. And they have taken to the open road eager for new adventure in every day. They are certain of the plans they have made, but know that plans are deliberately indefinite. It is more to travel than to arrive. Life has become their adventure and they find joy and purpose in sharing the adventure with others along the way.